Fresco secco by Theodora S. MacKay. This contribution is by Pierre MacKay, about a train trip from Vienna to Istanbul in August 1973. It was already evening when we passed through Niš, and I do not remember Sofia at all, but we came into Plovdiv in full daylight and the state police came pouring onto the train as soon as it stopped. There had been nothing sinister in the way we were treated during our time in Yugoslavia, but we crossed into another world in Bulgaria. From that moment on, my trip on what was ironically called ``The Marmara Express'' seemed to belong more to a 1933 Eric Ambler novel than to 1973. They were large and grim-faced and went through from both ends of the car, silently inspecting the passports of the passengers, all of them foreigners. Along the way they arrested an arbitrary lot of them, but the Czech couple in a second-class compartment next to the sole first-class compartment of which I was the sole occupant may have thought they were safe. Then, at the last moment before the train started up, a group of police stormed in on them and dragged the man off onto the platform. The train was already moving slowly forward as the woman heaved two suitcases out the compartment window and ran to the end of the car to jump off. There were two more removals of passengers at stations along the way, and, just before the Turkish border, an English girl was hauled off the train at a halt where there was not even a station. At twilight, I caught sight of a sign reading "Hudut Kapısı," and as we passed it, I thought that the Turkish language had never seemed so reassuring. I had chosen the Marmara Express as the last leg of a research trip to investigate Arabic Script manuscripts. It was supposed to go from Vienna to Belgrade, and then on to Istanbul, and it was only when we reached Zagreb, some 15 hours late for the connection southwards that it was borne in on me that the Marmara Express consisted of a single rather decrepit wooden railroad car. The train from Vienna had been diverted almost to Salzburg because of a spectacular oil-spill and fire along the Mur river, which threatened the very fabric of the rail bridge near Graz, and when we at last appeared at the Zagreb station there did not seem to be any decision what to do with us. The car in front of us ``The Salonica Express,” was fairly soon attached to a train going south but for some reason we had to remain in Zagreb where we sat in lonely isolation about six tracks away from the station platform, with no food, no drinking water and soon, no water of any sort. We were told nothing, and offered no opportunity to get food and water from the station. There was a group of English students in a second-class compartment a little way down the car, and we got together and took orders in sign language from families like the Iranians with two sickly children in another compartment who were struggling with the fact that there was no more toilet paper. We got out of the car, raced across the intervening tracks and clambered up on the platform to buy what we could carry, especially drinking water, and even a large flask of wine, which I was later to regret. We presented the Iranians with a large amount of water, at least, and made two more trips before we were informed that we would soon be attached to the end of a train going to Belgrade. At Belgrade there was less room for us there than there had been in Zagreb, so our lonely car was shunted into a side area not far from the freight yards and we were left in the dark—in all senses. The wine from Zagreb had by now given me a splitting headache, so I retired to my first-class compartment and tried to sleep on a bench too short for me by about 18 inches. Very early in the morning, the English students and I arranged a sort of relay, placing ourselves within shouting distance, so that we could be called back if the car was hooked up to some other train. I was the only one who read Cyrillic, so I got to make the purchases, which consisted of more water and a great deal of truly delicious bread, just out of the oven. I also read the schedule, and could see that there was no train we could be attached to before about 9:30, four hours later. Even so we were cautious about staying too long away from the car, and got back to it a little after 5:00. Some half an hour later, a ``luxury'' train for upper-level apparatchiks was rolled in beside us and left totally unguarded. We raided it, and took away all the water we could carry, all the soap, and all the toilet paper, most of which we offered to the now desperate Iranian family. Fortunately our car was hauled off into the main passenger area, and at some time in the late morning we were on our way, at no great speed, to Istanbul. 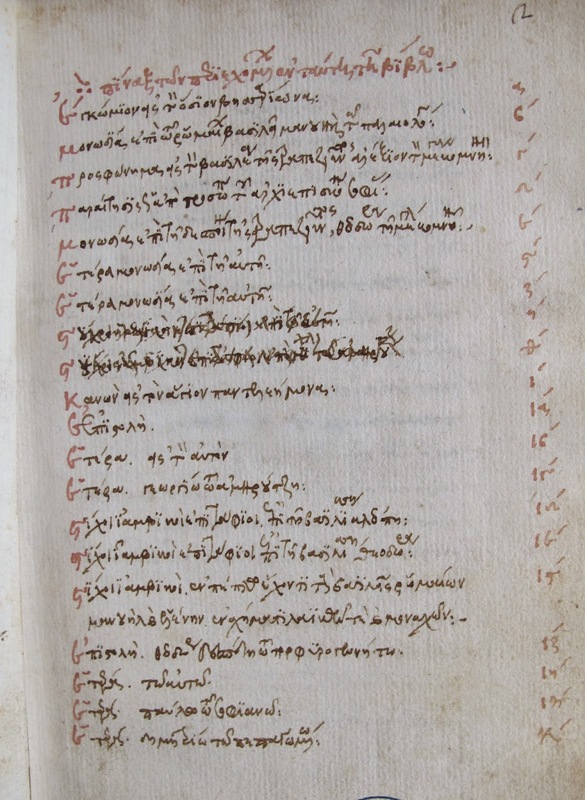 I recently discussed Bessarion's monody, one of four given at the μνημόσυνον for Cleofe Malatesta Palaiologina. The memorial would likely have been held at Ag. Sophia, where she had been buried. There was a thunderstorm that day, and crowds of people -- family members, officials, clergy, women of the court, townspeople -- had shoved their way into the little church and its burial chapels and porches. There was a newly-painted portrait of Cleofe and her husband over her tomb, and some of the speakers gestured toward it and said, "You," as they spoke. But we don't know which chapel the tomb was in. I spent some time in Ag. Sophia at the end of October, standing in each chapel, trying to envision the circumstances, trying to consider how well a speaker could be heard from various positions. Most of the people present wouldn't have heard the speakers, and most would not have understood the Greek the speakers used: what was important to them was that they were there. Hints in the monodies allow us to work out the order in which they were given. Bessarion's was the last. The first was by George Gemistos Plethon. What we have is probably not quite the speech that he gave, but his edited written text. The magic name of Plethon has preserved this monody in twenty or so copies (one is bound with the only copies of the Bessarion and Cheilas): the other monodies survive in one copy each. Plethon's has been used, or parts of it, a number of times by a number of writers, for what it says about the soul. What has been completely overlooked is that Plethon's discussion of the soul comes from his portrayal of a very specific soul, Cleofe's soul, and then from his portrayal of her husband's. Gemistos began quietly, speaking of Solon's idea of goodness, and how one could not be sure of human fortune until death. "For this reason," he said, "one would consider epitaphs and funeral addresses to be more reliable than any other encomia . . . for they are concerned with matters already securely established . . . The Athenians . . . thought it right to use these addresses." Gemistos anchored the storm-blown mourners firmly in the Athenian tradition: "We, likewise, have come forward in this commemoration, not only to speak for our most holy ruler's now-departed wife who achieved a good ending to life . . . but expressing thanks for the reverence and understanding she always exhibited." He then reminded them that Cleofe had come from Italy whose Romans had ruled the best part of the settled world, from the Danube to the Tigris to Libya to the Atlantic, and that she came from heroic ancestors. "She came here, lovely and good, to dwell with our most holy ruler . . . bringing with her shining adornment of body and soul, for she was tall and lovely, and had matured into every sort of goodness. . . She, however, exhibited, in addition to the beauty of her body, which was radiant, an even more radiant and holy quality of soul, and showed that her body was a sort of image of the beauty of her soul." This is an extraordinary emphasis on Cleofe's body, however beautiful, and it should be remembered that Plethon believed that physical desire was a divine gift, and that it was through the body that we become like the gods. "Living in this manner, and with such occupations, practicing and studying, always adding more good to good things . . . and I would add that she recently took part in the most sacred of our feasts and our mysteries." He would have known as well as any of Cleofe's anguished "conversion" to the Eastern rite. "She departed this life from an affliction beyond the powers of all medicine, so that she seems so dear to God from all these to have been taken up by God, and she left despair in her subjects . . .."
Leaving the subject of Cleofe specifically, Plethon went on to say that there is a part of us that is mortal, and a part that is immortal, the most important part. The body is a kind of garment, and when we take off this garment, it is wrong to mourn when the important part has moved into a better life. It is the life we live here that prepares us for that life, as did Cleofe's life, while a person who takes no care for the divine in this life will have no contact with it in the next. Almost all people believe in this continuing life. The creator, as a good master, would not have given us the longing for eternity unless there was an eternity to long for. Non-rational animals do not because they do not understand cause or infinity. The one who knows something about God must have something in common with him, and we could not know this everlasting life without a desire for it. Then Plethon moves to suicide, a peculiar topic in the circumstances, unless he knew something that made this topic relevant. Many of us who have been widowed have had the experience of being carried along at first, perhaps by shock, but with the sense that we are managing remarkably well. Then about a month along, there is a great crash and an all-devouring depression. It is clear, from Bessarion's monody, and particularly from Plethon's conclusion, that Theodoros had fallen deep into a depression, to the point that it had become a political as well as a personal problem. He had earlier written a poem to Cleofe that looked forward to a radiant reunion in the presence of God. Had he mentioned to Plethon the possibility of anticipating this? It is difficult to think why Plethon would have otherwise brought up the subject, particularly in such public circumstances. He explained that non-rational animals do not commit suicide because they cannot envision their non-existence. Nothing seeks its own destruction, so a human would not consider suicide if it would have that result. A person who is suicidal must feel that suicide just allows it to move out of the body. Plethon clearly allows more understanding of someone who is suffering, than did -- and does -- church teachings. Plethon concluded with a firm statement of comfort, correction, and encouragement. Who else at Mistra could have spoken to the ruler so critically in public? "If the belief is established as certain within us that the soul is immortal, we shall be nobler and better, and shall bear such losses more gently. And so, most holy ruler, consoling yourself with these words, give up despair, considering again that you were born to preserve the common good in the face of troubles, but despair will stand always in the way of such action. You see how the menace has progressed and requires great concern for recovery and return to safety. This rests on you, and only if you will take care of it appropriately will all the rest follow you so that, if God wills, we shall be saved. "But, if you are indifferent, our danger will increase. Consider that if some mischief occurs—may that not happen—all will place the burden of it onto you, while if something happens to rescue us you will carry off the fame of it. So, understanding that you will in either of these cases have the greatest credit and, as your duty to God, who entrusted you with governance over us, stand before us, stronger and more attentive, and God will give you the diligence to be the rescuer of our community and provide you with whatever is necessary. And it has to be that, since your actions bringing us toward salvation will be great, and never trivial that, as well as by us, among all the rest of humanity you will be held in high esteem. My thanks to Pierre MacKay for his work on the translation. 15th-century remains of fief boundary wall and tower at Myloi. It is easier to think about fief churches than fiefs, because with churches you have a definite building in a specific place. For the fiefs of the Frankish and first Venetian occupations, you have in a very few cases the name of a general area. When the Franks divided up the Argolid as of 1212 or so, it is probable that they used the general divisions already used by the Byzantines. The Aragonese version of the Chronicle of the Morea says that two Greeks who knew the whole country helped the Franks with the division of the territory. All we find for the Argolid is that the Foucherolle family was given three fiefs or cavallerias in Argos and Corinth, and many others were given one and two cavallarias. It is not clear how much land was involved in a cavalleria but many Greeks received them, as well as Franks. To suggest possible numbers in the Argolid, Passava and Helos each had 12 fiefs, Patras 24, Escorta 22, Arcadia 8, Damala (considered part of Corinth) 6. A report on fiefs from 1391 gives Clarentza and Kalamata 300 fiefs each, Vostitza 200, and says the despot has 40 in Mani. For a completely different area, in 1500, Crete was divided into 391 cavallarias. Each fief or cavallaria in Crete had 50 boine or fields. A boina was the amount of land that could be plowed in a day, and each could support two families of villani or paroikoi. There is nothing to let us know whether the Cretan system was applicable in the Morea. The Frankish system of privatized justice and privatized military fit well with the Byzantine rule in the Morea. We have no idea what shifts might have occurred as the culture of the Franks from north-western France became the culture of Franks from southern Italy during the next 180 years or so. Venice took over the Frankish Argolid in 1394 in a treaty with Theodoros I of Mistra, guaranteeing to protect the traditional rights of the inhabitants. What those traditional rights might have been in relation to the fiefs after 180 years of foreign rule, we have no idea. The significant change Venetian rule brought was that justice and the military came under the control of the governors of Argos and Nauplion, and the fief was a means of collecting taxes which apparently became more stringent. In the Venetian land system, all the land belonged to the state. There seem to have been several categories of land-holdings. The fiefs which were comparatively large, and were heritable. Then there were large land-holdings that were rented out for 5, 10, or 29 years. My “fief” churches may have belonged to these landholdings as much as to fiefs. There is good evidence for substantial Greek ownership of these. Another division of land came in 40-stremmata plots, plus another 5 of vineyards, which were given to the immigrants Argos needed to repopulate its empty countryside. The 40 stremmata plus 5, allowed a family to make a basic living and pay the taxes required in cash and farm produce. Venice tended to make land divisions relate to the productivity of the land: we don't know if the Franks followed this system in the 13th century. Another division of land was the territory given to stratioti who were responsible for raising their own food and horses, and we know nothing about amounts of land there. It is unclear whether an appropriate unit of territory was assigned to a particular band of stratioti, or whether land was assigned individually. Argos seems to have assigned plots of land to individual stratioti, but that may have been a special case. Essentially, we have minimal information about the Venetian land system, but Bartolomeo Minio's letters suggest that he considered the landworkers – villani or paroikoi – hard-pressed. He does give us a little information about fiefs, and what he does say suggests fairly large divisions of land. Given the locations of the fiefs he mentions, I would wonder if the areas farthest from Nauplion were made into fiefs, and lesser divisions of land were closer. Minio only identifies the fiefs of Kiveri, Thermissi, and Kastri. After two difficult conferences that divided the Ottoman-held territory from the Venetian, Minio writes of “the feudatories who have recovered the lands of their fiefs.” The cumulative information about fiefs gives erratic information about productivity, owners, and local morals. The bishop of Nauplion (who never visited his see) held the fief of Thermissi which was administered through a local agent. The bishop had half the profit from the Thermissi salt pans, Venice the other half, from which 900 kilograms of salt was exported annually. There was a fief with a castle at Kiveri (the former name for Myloi) whose primary income was from water mills. The fief's boundary line is shown above. A fief of Kastri, held by Sier Francesco Alberto, had a fortification into which people could come when under threat. Sier Francesco seems to have lived primarily in Nauplion. In Crete, landholders had to have houses in one of the main cities – Candia, Chania, Rethymnon, or Sitia. There is no information as to whether this was the case with the Venetian Morea, though the case of Giovanni Cavaza (below), combined with Sier Francesco, suggests it might have been. Giovanni Catello had a half-fief of vineyards. Giovanni Cunia had a fief of 200 stremmata which he was required to plant half in vines and half in grain. He apparently grew linen and was also required to have a beating yard and a machine for smashing linen stalks, for which he had permission to obtain wood and materials from Venice. Damian Agrimi seems to have had a fief (or perhaps a land allotment) near Kastri from which he shipped cheese, as did Zorzi da Londa. Giovanni Cavaza, who seems to have been doing a little embezzling in his job as castellan of Nauplion, came into possession of one of the Foucherolle fiefs which had been in that family for six generations. At least half the fief was in vines: he also had a solid business in linen and wool. He had a house on Akro-Nauplion, and one outside the walls which he willed to his wife and then his sister. He seems to have died about 1405. In 1412 the governor of Nauplion gave half the fief to Manoli Murmuri, from the leading Greek family of Nauplion. After three years of suits and counter-suits, the half-fief was transferred to Giovanni Catello, from the leading Venetian family of Nauplion. This half-fief was apparently worth killing for, and this is where the story gets complicated. In 1416, Giovanni's brother Michali, Nicolò Murmuri, and someone's brother named Gregorio tried to kill Giovanni, who was so badly injured that he lost his right hand. Eight years later, in 1424, these conspirators bribed a villano to kill Giovanni when he was out in the vineyards . Again he survived the assault, although he received five wounds. The villano disappeared, but his brother testified against him and Michali, Gregorio, and Nicolò. Giovanni made a complaint to the Venetian Signoria against the three: we have no further information, even though the story has gone on for at least nine years. Bessarion's index to Marciana Gr Z 533 (coll 778). Of the writings included here, some were produced while I was still young and setting myself to the practice of writing for the first time, while I still had no ecclesiastical rank, since I was still tender in my years . . . Others in this collection, going on as time allowed, were published, some at the time of my ordination as I was brought into holy orders, others when I became patriarch . . . in addition a long letter to the Despot Constantine when I had already been raised to the rank of cardinal -- these letters which, even if they are not worthy of deep thought, I have an affection for as my own children, and I have put them in the book as a reminder for ourselves, rather than of value for others. * Monody for Manuel II. * Discourse to the emperor Alexis of Trebizond. * Legal act in the name of the archbishop of Sophia. * Monody for the empress Theodora of Trebizond. * Another monody for her. * Canon to S. Pantaleon. * Letter to the same. * Another letter to Amiroutzes. * Epitaph for the basilissa Cleofe. * Epitaph for the basilissa Theodora. * Verses for a tapestry for the tomb of Manuel and Helena. * Letter to Theodoros II. * Letter to Paul Sophianos. 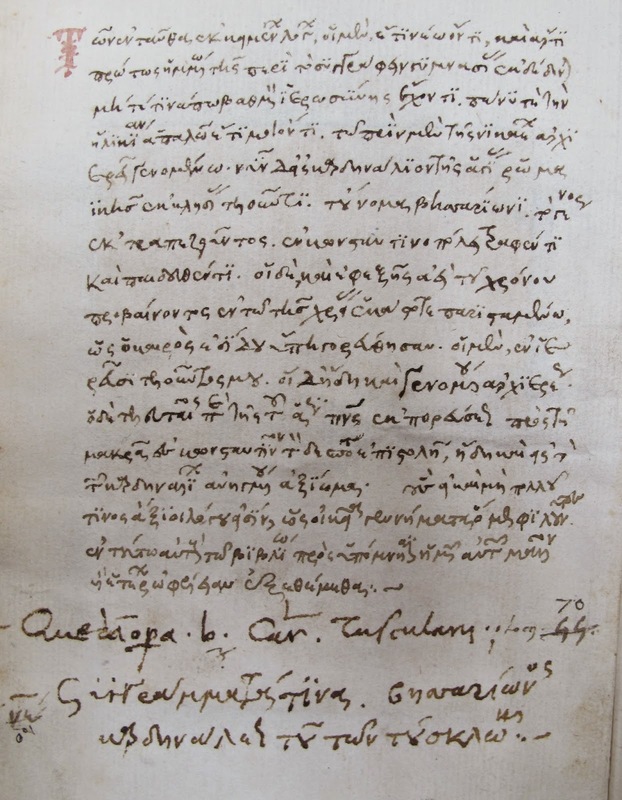 * Letter to Demetrios Pepagomenos. * Letter to Nikephoros Cheilas. * Letter to the monk Dionisios. * Letter to John Eugenikos. * Letter to the monks Matthaios and Isidoros. * Address to the synod of Constantinople in the name of the archbishop of Trebizond. * Monody to John VIII on the death of his wife Maria of Trebizond. * Speech made at the opening of the Council of Union in Ferrara. * Letter to Constantine, Despot of Mistra. Notice that the contents include 7 monodies -- 7 formal funeral laments which were sent as gifts to the family of the dead and read out at formal memorial services. One monody was for Manuel II, but the other 6 monodies are for women -- for two women, actually. Which brings us to the missing manuscript. A monody. His monody for Cleofe Malatesta Palaiologina is missing. 533 has a number of document from his Mistra period -- letters, and three poems for members of the imperial family, one of them Cleofe. Why would he have omitted this monody? Granted, it is fairly tedious and even incoherent in places, but so are the other monodies listed (except for Manuel's). It could not have been later removed from 533: all the pages are accounted for in his index. I can speculate (with no evidence) as to why he would have decided to omit this document from 533, but the monody is missing from all the other manuscripts of his writings as well. The sole copy is to be found -- or was found ninety-some years ago -- in the Bibliotheque Nationale in Paris, and printed in volume 4 of Spyridon Lampros' Παλαιολόγεια καὶ Πελοπονησιακά in 1924/30, along with other monodies for Cleofe. The monody by Cheilas follows Bessarion's in the Paris manuscript. The Pepagomenos monody is in the Vatican. There are several copies of the Plethon monody -- thanks to his magic name -- in Madrid, Bucharest, Belgrade, the Escorial, Leiden, with two in Milan. This disaster -- her death -- has touched every race. She cared for them from her own resources. Her work was impossible to conceal, even if she avoided incense and lighted torches. She was a city founded on a mountain, impossible to hide (a reference to Mistra). She flew out of her husband's hands, leaving him crying tears of blood. He was cut in two, and we see see that the high-born suffer as do the humble. The reasons must be left in the hands of God. Who that knew her could not mourn her? She accepted respect from the ladies of the court, but she did not compete with them. She knew she was beautiful, but she had no concern about it She wanted to go beyond it and be good. She had the intelligence to chose the good, and the ability to follow through on what she had chosen. She was quick to select the best solution to an argument. Who can adequately express what we have lost? We could have lost anyone else without hurt, but she was our guardian, our benefactress, our protector, and our enjoyment of her goodness was never satisfied. No one has been left unwounded. Bessarion concluded Cleofe's monody with an apparent criticism of Theodoros whose inability to deal with his grief has contributed to a sense of disorder. This reflects the opening sentence, first written for Theodora, "O, the passage of disordered time," and then Bessarion mentioned the order Cleofe had brought to them. So I wonder why this manuscript is missing. Was Bessarion, more than ten years later, still unable to face so tangible a reminder of the disorder, of the loss of Cleofe? The photographs of 533 are by John Burke.